For both sub-units a common CV Transpose input is available (1V/octave, range 0...+10V). The voltage applied to this input is added internally to CVN before the Midi note number is generated. It can be used e.g. to transpose two sequences simultaneously by one voltage. Important notes: The CV voltage has to be present at the rising edge of the gate signal. It seems that for some sequencers on the market that's not true. If a sequencer generates the CV after the rising edge of the gate the A-192-2 will output apparently wrong Midi data because an "old" CV is taken to generate the Midi data. But that's a problem of the sequencer, not the A-192-2. To fix this problem the A-192-2 would have to "wait" a couple of milliseconds (depending upon the delay between Gate and CV of the sequencer in question) before the CV is measured. But this would degrade the timing because then the Midi data are sent later then the rising edge of the gate signal. Please clarify if you want to use the A-192-2 with a sequencer if the CV/gate timing is correct (for the A-155 that applies of course), i.e. please ask the manufacturer of the sequencer in question if the CV is generated before the Gate and not the other way round. Another problem may occur if already quantized control voltages are used (actually the A-192-2 was designed for non-quantized control voltage like "pure" analog sequencers without quantization). If the voltage steps of the incoming quantozed CV are very close to the thresholds used by the A-192-2 to distinguish between two Midi notes it may happen that now and then the neighbouring midi note is chosen. The A-192-2 does not "know" anything about the sequence structure but converts each CV independent from each other. Adding or subtracting a small voltage to the CV coming from the quantized CV source usually helps to solve the problem (e.g. by means of the upper channel of the precision adder A-185-2) because then the voltage steps no longer match to the thresholds of the A-192-2. The data generated by the module are transmitted simultaneously to Midi Out and USB. 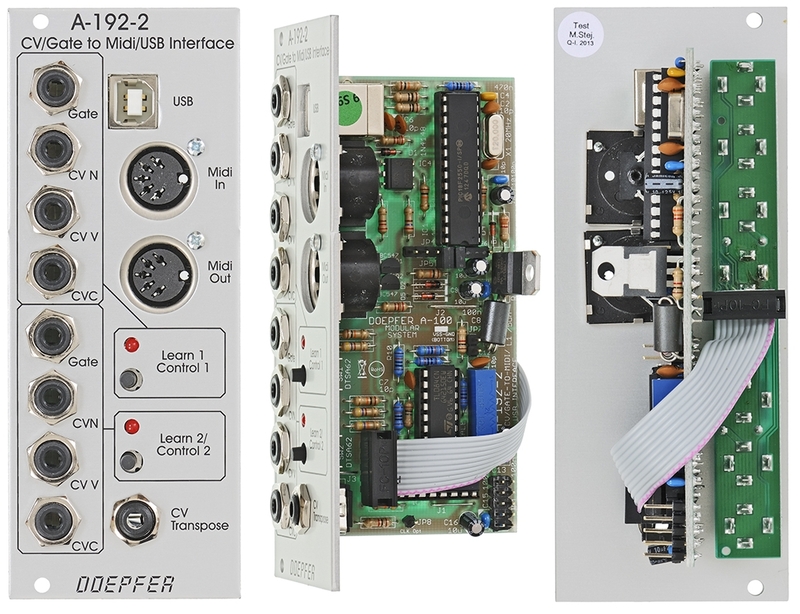 Two or more A-192-2 modules can be daisy-chained via Midi Out - Midi In. Incoming Midi data is merged to the Midi output - provided that the incoming data volume is not too high (because of the limited Midi Input buffer of the module). A Midi keyboard or a second A-192-2 are no problem but please do not try to merge a fully loaded 16 channel sequencer track. If bipolar or negative voltages have to be converted an offset generator is recommended (e.g. A-183-2). There is also an internal jumper available on the A-192-2 board that adds about +5V to the incoming control voltages CVN, CVV and CVC as soon as the jumper is installed. The pin header for the jumper is labelled "JP7" (next to the grey ferrit core).